The channel partner will deploy BuildTrack’s Building Management System (BMS) in ‘The 42’ to enable the control and monitor of operations across the building and this BMS system will largely serve as the building’s Central Nervous System. The BMS system will monitor various safety and security sensors that are deployed throughout the building to make the living safe and secure and enable quick response to any sensed events. BuildTrack’s BMS will also provide both control and monitoring of all the electrical assets of the building to improve the building operations including, Lighting Control, Access Control, CCTV Cameras and Video Door Phone. BuildTrack’s perimeter security solutions using laser beams and gate management will also be monitored through the same BMS system. The latest Yale locks are to be provided throughout the building and will be accessible via Smart Apps to residents, along with key information about the sensors in their homes. BuildTrack’s Home Automation for apartments offering a broad range of comfort and convenience features on Smart Apps for individual owners are also made available as an extension of the Automation System. 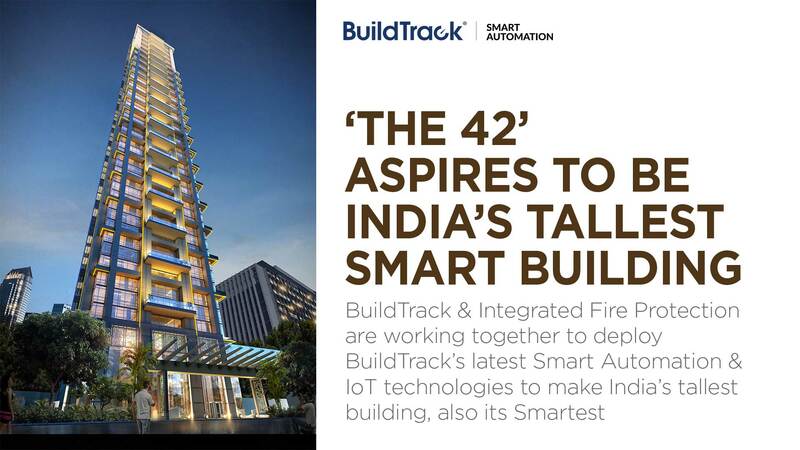 ‘The 42’ is on its way to become the poster-child for Smart Buildings not only in India but across the globe, using BuildTrack’s Smart Automation technologies that are innovated and made in India. THE 42 (https://en.wikipedia.org/wiki/The_42): The 42 is a residential skyscraper in Kolkata in the state of West Bengal in India. Built by developers Mani group, Salalpuria Sattva group, Alcove Realty & Diamond Group, The 42 is Kolkata’s tallest residential building. Located in the middle of the city, Chowringhee, the tower has 62 floors. BuildTrack (www.BuildTrack.in): BuildTrack is a leading brand of Smart Automation & Internet of Things products and solutions from Surmount Energy Pvt Ltd. BuildTrack’s Building Management System (BMS) is a solution that provides a single point of control and monitoring for the building. This access to the sensors and assets of the building is provided through BuildTrack Kiosks or Smart Apps for practically everything in a building or campus – ranging from safety/security sensors to water tank level sensors, STP, energy meters, control of lighting, pumps and more. Integrated Fire Protection Pvt. Ltd (http://www.integratedfire.in/): IFP is the authorized channel partners of BuildTrack. We are an ISO certified organization, engaged in manufacturing, exporting and supplying fire extinguishing chemicals, fire extinguisher, foam fire extinguisher, foam concentrates and dry chemicals. Formulated using quality raw material, these chemicals are widely used in chemical tank terminals, oil fields, gas fields and OEMs.